Jennifer Palmer received her training at The Raleigh School of Ballet where she was a member of the school’s Professional Division and its affiliated performance training company, Raleigh Dance Theatre. Ms. Palmer also attended summer intensive programs with the Houston Ballet, Pittsburgh Ballet Theatre, and Carolina Ballet. 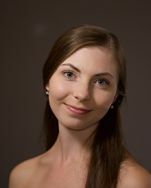 Ms. Palmer was invited by Carolina Ballet’s artistic director, Robert Weiss to perform company roles during the 2012 and 2013 seasons. She was just awarded and accepted a young dancer trainee position with Carolina Ballet. Ms. Palmer received her teacher training under the guidance of RSB faculty member, Patricia Batchelor. She served as Ms. Batchelor’s assistant in the Creative Movement and A Level classes.